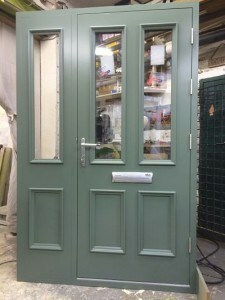 Belfast Bespoke specialise in locally made, high quality, solid, wooden doors. Should you need Exterior or Interior wooden doors we can help. Experts in Bi-folding or sliding patio doors. From arched doors and matching frames to kitchen and cupboard doors Belfast Bespoke are the leading suppliers of Bespoke wooden doors in Belfast and the surrounding areas. Here at Belfast Bespoke you are not limited to the style of wooden door normally offered ” off the shelf ” We Manufacture some of the finest wooden doors in the country and we’re proud of it. Being custom made, our bespoke timber doors offer a vast range of designs and sizes. Each one of our bespoke wooden doors are individually hand made to your specific requirements. This ensures a perfect fit and proper proportions in any size opening. We only use the highest quality, hand picked, solid wood from sustainable sources. Every wooden door is constructed using time served traditional methods and modern joinery practises. This means your bespoke wooden door has the strength and durability to last. We can make many different styles of wooden door and matching frame to suit any property. From traditional Victorian to modern contemporary. We believe that our bespoke doors are among the best available and look forward to helping you find the perfect style to compliment your home. Door frames, door linings, skirting boards and architraves can also be made to compliment your new wooden door.